Though CB radios are most famously used by truckers, many drivers still appreciate their power and make use of them all the time. Handheld CB radios, in particular, are very popular for people who are traveling by foot or on bicycle. They’re lightweight, easy to carry, and capable of doing the same things that ones mounted on a truck or car are capable of doing. Used to communicate openly with other drivers, they are great tools to have in a case of emergency, to get information about road conditions, or simply as a means to talk to someone. But, what makes a great handheld CB radio? This guide will give you all of that information and more. Located in Japan, Uniden is a company that specializes in making high quality wireless communication equipment. From surveillance systems, to telephones, to CB radios, the company’s products are characterized by top-notch function and durability. Their top CB radio at the moment is their Uniden PRO401HH Professional 40 Channel Handheld CB Radio. It combines compact construction with reliable performance to create a product that will never let you down when you need it. Offering 4 watts of output power, it meets the FCC maximum for radios of its type, allowing you to cover as much range as is legally possible. Equipped with a high power/low power button, you can choose to either use the full 4 watts, or just use half of that when engaged in short-distance conversations. Powered by 9 AA batteries, it makes us of only alkaline batteries. Rechargeable batteries are not recommended with this radio. There is a power jack to which you can hook a car charger or wall charger, but these things are not included. A small LED screen allows you to easily see what channel you are on, and well-placed buttons make for simple operation. It provides you with 40 channels, all of which can be reached with the scanner button that stops every time it comes to a channel which is currently being used for communication. With terrific sound quality for both incoming and outgoing signals, you will be able to hear and speak with precision and clarity. Though it does not come with an antenna, one can be purchased and attached with general ease. If you’re looking to carry this radio around with you, it’s very easy to do so. Measuring in at 4.3 inches x 2.8 inches x 8 inches and weighing in at just one pound, it is easy to take with you on the go, and can likely even be stuffed into your pocket. Online reviewers love it for how well it performs, with one reviewer stating that he and his friends who are truckers have started using it and that it works as good, if not better than a mounted, built-in radio. Reviewers also credit its construction, stating that it seems to be built with care. They note how tight the knobs feel, and how the buttons click audibly every time they are pressed. Some reviewers criticize its microphone, stating that it’s not very loud, and with one reviewer noting that he “practically had to eat it” to get any sound to go through. However, quite a few reviewers were more than happy with its volume capabilities, so this could just be an outlier. A few reviewers complained that it was not easy to modify, noting how difficult it was to get into the housing and move wires around. Overall, the Uniden PRO401HH Professional 40 Channel Handheld CB Radio is a great product that’s compact and easy to use. Though it might sacrifice something in the way of microphone volume, it sends through a very strong signal. And, if you really need it to, it’s completely capable of hooking up to another microphone. If you’re looking for something to take on the road with you so that you can communicate with other drivers with ease, the Uniden PRO401HH Professional 40 Channel Handheld CB Radio is a truly great option. It’s available for around $45.00 on most online retail sites. Based in the United States, Midland Radio is a company that specializes in all things radio. From industrial radios, to marine radios, to CB radios, the company manufactures top of the line products with precision and care. 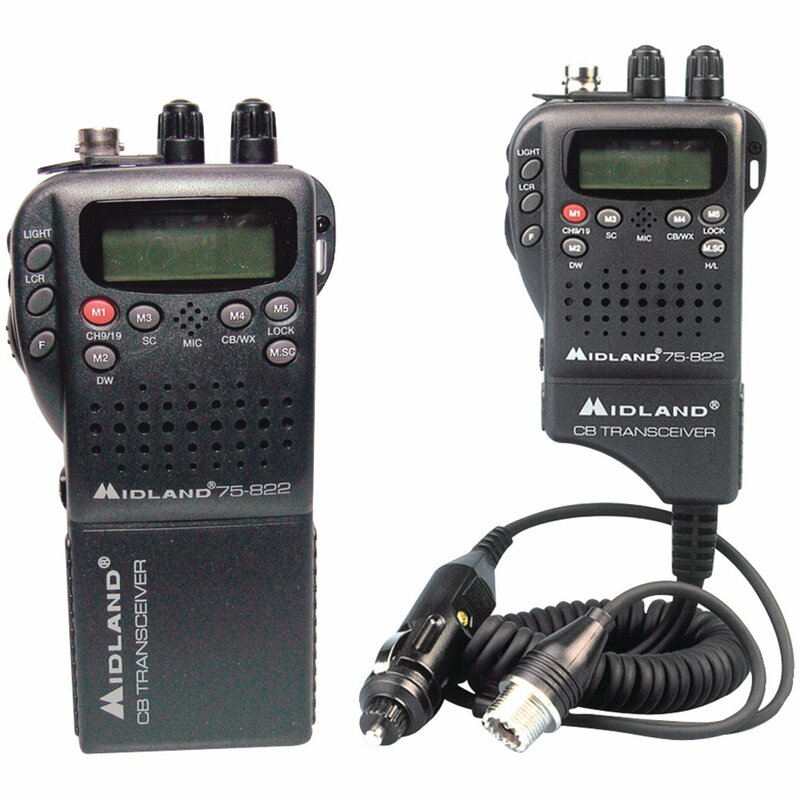 Their premier handheld CB radio is the MIDLAND RADIO-Handheld Mobile CB w/ Adapter. Lightweight, highly functional, and easy to operate, it’s a great choice for anyone looking to communicate on the road. It provides 4 watts of power for outgoing signals, giving you the maximum amount allowed by the FCC. Possessing a high power/low power button, you are able to use all 4 watts, or conserve energy by using 1 to 2 watts for short-distance communication. Capable of being used in many different situations and settings, it can be powered in 1 of 3 ways. One way is with an AC wall adapter that allows you to plug it into a power outlet. The next way is with a car adapter, which is included, and which allows you to plug it into the car’s cigarette lighter. The last way it can be powered is with batteries. If you’re using batteries, it requires either 6 disposable double As or 8 rechargeable double As. Well-placed, easy-to-use buttons and a clear easy-to-read screen make it highly functional and user-friendly. It is capable of reaching 40 CB channels to go with 10 weather channels, providing you with a great number of communication possibilities. These channels can be easily found with its scanning buttons which stop on a channel every time communication is happening on that channel. Allowing you to get to the emergency channel and the trucker channel quickly is its quick scan button. A squelch control button allows you to cut down on outside noise, making for the most clear and precise sound possible. With a flexible rubber antenna that can be bent and contorted, it is very simple to store away or carry anywhere. It measures in at 10 inches x 7 inches x 3 inches, and weighs in at 1.7 pounds. Online reviewers love it for its weather monitoring capabilities, noting how useful it is during storms when the power has gone out. Reviewers also laud it for its ability to save desired channels, allowing you to go to chosen channels with speed and convenience. Several reviewers said that everyone should own one because it provides an extra source of safety and protection at all times. Some reviewers complained of its short range, stating that it couldn’t reach any further than a mile. This will likely make it appropriate for only emergency purposes. A few reviewers criticized it for its lack of durability, stating that it cracked easily and allowed batteries to fall out. It should be noted though that this didn’t seem to be a huge problem with most reviewers. 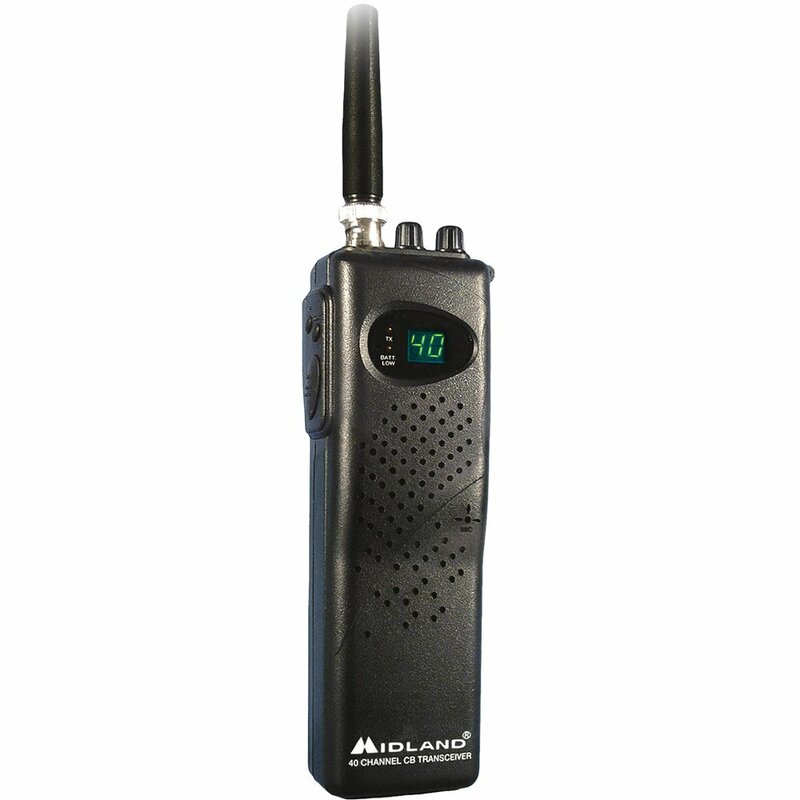 All in all, the MIDLAND RADIO-Handheld Mobile CB w/ Adapter is a great product for on-road emergency purposes. Its range is limited, but for who it does reach, it transmits a very clear and precise signal. If you’re looking for something to have on hand in the car in case of emergency, or something to have around the house in case the power goes out, the MIDLAND RADIO-Handheld Mobile CB w/ Adapter is definitely something to check out. It’s available for around $90.00 on most online retail sites. Cobra Electronics Corporation is a company responsible for a bevy of communication devices. These devices include everything from marine radios, to walkie talkies, to CB radios, and more. At the moment, the company’s premier handheld CB radio is the Cobra HH 38 WX ST 4-Watt 40-Channel CB Radio. Compact and highly functional, it is a great product for anyone looking to communicate with other drivers on the road. Offering the standard 4 watts of outgoing power, it is described by the company as being able to travel up to 4 miles. Most reviewers noted that it would go about 2 miles when they were using it. It can be powered either by batteries or by DC connection. This allows you to use it at home with a power outlet, or on the go with 9 AA batteries. Possessing a high power/lower power switch, you can decide whether or not you want to use less wattage for short-distance communication. Also included is a 12v car adapter which allows you to plug it into a car’s cigarette lighter. This ensures that, as long your car is on, your radio will be powered. Well-placed buttons and an easy-to-read screen allow you to switch channels with ease and efficiency. With 40 CB channels along with 10 weather channels, you will never be starved for communication and information. The channel scanner buttons will automatically shuffle through channels until they reach one upon which communication is taking place. This will greatly reduce the amount of work you have to do in order to find someone to talk to. Its sound tracker system helps to cut down noise, making for a more pleasant, clear, and precise sound both incoming and outgoing. Made of flexible rubber, its antenna can be bent to accommodate small and compact storage areas. Overall, the device measures in at 2.5 inches x 5.5 inches x 1.25 inches, making it very simple to store, and even carry around in your pocket. It weighs in at 1.2 pounds. Online reviewers love it for its sound quality, stating that their voices come through loud and clear, and that they can hear incoming sound with precision and clarity. Reviewers also give it credit for its construction, stating that it’s very solid and durable, and that the buttons are located strategically so that they can be easily pushed whenever they’re needed. Some reviewers criticize it for its small reach, stating that they have trouble communicating with anyone outside of 2 miles without the use of an additional external antenna on their car. A few reviewers criticized its sound equalization system, noting that they would pick up static on the trucker channel as well as other channels. All in all, the Cobra HH 38 WX ST 4-Watt 40-Channel CB Radio is a great product for those wishing to communicate with drivers who are nearby. It doesn’t possess incredible reach without an additional antenna, but for who it does reach, it delivers a crisp, clear sound both outgoing and incoming. If you’re looking for something to keep in your car in case of emergencies, the Cobra HH 38 WX ST 4-Watt 40-Channel CB Radio is definitely something you should check out. It’s available for around $70.00 on most online retail sites. It’s true that Handheld CB radios can get a little expensive. And, maybe you aren’t looking for something with all the bells and whistles. Perhaps you just want something on hand in case of emergency situations that allows you to communicate with fellow drivers, and get weather and traffic updates. If so, there are a number of viable options available. One of these is the Midland 75-785 40-Channel CB Radio. Easy to use and capable of delivering crisp, clear sound, it is a great tool to keep in your car. Like all standard CB radios, it offers 4 watts of transmitting power. It also possesses a low power/high power button that gives you the choice of conserving energy for short range communication. This will allow its battery to last much longer, providing you with the most bang for you battery’s buck. To use it on the go, it requires 9 AA batteries, which can be either disposable or reusable. If you do use reusable batteries, they can be charged while still inside of radio. You won’t have to waste time taking them out. You simply have to attach the power jack to outlet wire that’s included with it. If you’re using it in your car, it comes with an adapter that allows you to plug it into a cigarette lighter. As long as your car is running, you won’t have to every worry about it running out of power. Providing you with 40 different channels, it is capable of scanning until it reaches a channel on which communication is happening. You won’t have to search each channel manually until you find something. Coming with squelch control, it eliminates unwanted background noises, allowing your voice to come through with crispness and clarity. Assisting in this aspect is its automatic noise limiter which cuts down on noise without you having to tweak any knobs. Its antenna is made from a flexible rubber material, allowing it to be twisted and contorted so that it can fit in tight spaces. If need be, the antenna can even be removed and reattached. Measuring in at 7 inches x 2.12 inches x 1.75 inches, it is very skinny and compact, and could even be carried in your pocket if it needs to be. It weighs just 1 pound. Online reviewers give it credit for its ability to pick up signals from nearby truck drivers, stating that it’s a great way to get an idea of the coming road and traffic conditions. Reviewers also give it credit for its range, with one reviewer stating that he had no problem talking to people who were located 6 miles away from him. Some reviewers criticized its outgoing sound, stating that other drivers would tell them that they needed to get their radio fixed whenever they would speak to them. Other reviewers complained that the headphone jack was not compatible with their headsets, noting that the description says it is compatible with all types of headphones. All in all, the Midland 75-785 40-Channel CB Radio is a nice product for its affordable price. While its output signal sounds muffled and filled with noise, its incoming signal sounds very clear, allowing you to hear nearby drivers with precision and clarity. 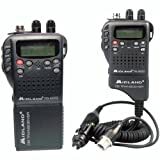 If you’re looking for something to keep on hand in your car in case of emergency, you should definitely take a look at the Midland 75-785 40-Channel CB Radio. It’s available for around $40.00 on most online retail sites. Gain is used to determine how strong a signal has to be to come through the receive side of the radio. By blocking out signals that aren’t of the proper strength, it will reduce the existence of white noise, making for a clearer and more listenable signal overall. It is particularly useful when talking to someone who has a strong signal, as it will easily receive his or her voice without receiving the sound of an engine or other errant noise. It also allows you to pull in weaker signals and hear them with more clarity and precision. Squelch control is a standard function in all CB radios, and sets a minimum limit at which the operator must speak in order for radio to hear his or her voice. This makes it so that there isn’t annoying static coming through it when it’s not being used. Both of these functions are key to a CB radio, and can be the difference between a good one and a bad one. You should test these functions out in person before making a purchase. You want to make sure that you don’t have to deal with errant white noises. A valuable feature for a CB radio to have is the capability to act as a public address transmitter. Essentially, it will send a wireless signal to PA speakers, allowing you and others to hear your voice at very loud volumes. This can be very useful at functions where a PA is needed, as you can walk anywhere and still be able to talk over the loud speaker. Of course, though many CB radios are capable of transmitting a signal to PA speakers, you will usually need to buy the speakers separately. Before making a purchase, it’s important to consider everything that you will need to use it for. You don’t want to buy one that doesn’t have PA capabilities only to realize that you can’t use it for such a thing. If you think you might use it at some point, you should spend the extra money. Single-side band is a great feature if you’re willing to spend the extra money. Typically available on high-end CB radios, it gives you access to as many as 80 additional channels, allowing you to make contact with a bevy of other people. For most radios, the FCC sets a transmit power maximum limit of 4 watts, but with a single-side band, you can transmit up to 12 watts legally without a license. Of course, it’s important to note that you can only use the SSB function with other users who also have the function. You might be able to hear them. But, you won’t be able to talk to them. However, all SSB radios allow you to switch to standard AM-mode, allowing you to communicate with people who only use 4 watt radios. By giving you the ability to dial into more precise frequencies, these types of radios will greatly increase your listening radius. It’s certainly not a necessary function by any means. But, it can lead to much greater communication overall. In general, CB radios scan channels in two different ways. These two ways include instant channel and channel scanning. Not all radios will have the instant channel function, but those that do are capable of switching to one of two different channels very quickly. These two channels include channel 9, which is the emergency channel, and channel 19, which is the highway/truckers channel. It’s not a necessary function, as you will still be able to access these channels regardless, but it does allow you to get to the channels at a much faster rate. Channel scanning simply refers to how the radio will stop at the next functioning channel every time the tune button is pressed. It essentially works just like a typical car radio does. This simply allows you to get to working channels at a much faster and more efficient rate. All CB radios possess this function. If you’re looking for a way to communicate with other drivers on the road or trail, a CB radio is just what you’re looking for. You can learn about road conditions before the news reports on them. You can communicate emergencies to as many people in as short of amount of time as possible. And, you can talk to strangers to quell boredom during long trips. While most general CB radios are capable of the same things, there are a few features to consider when choosing one. Gain, Squelch, and PA capabilities will greatly affect the quality of the signal you get, and have the power to make a purchase either good or bad. It’s important to do a lot of research. Read a lot of reviews. Peruse different product descriptions. Only after you have done this can you purchase a handheld CB radio that fits you.